In the final weeks before Election Day, a scary statistic emerged from the databases at Barack Obama’s Chicago headquarters: more than half the campaign’s targeted swing-state voters under age 29 had no listed phone number. They have adopted a wireless cell phone only lifestyle, effectively immune to the obsolete 20th century "voice phone bank canvassing" get-out-the-vote efforts. For a campaign dependent on a big youth turnout, the inability to contact young cell phone only voters could have been a crisis. But the Obama team had a solution in place — a Facebook application that will transform the way campaigns are conducted in the future. For supporters, the app appeared to be just another way to digitally connect to the campaign. But to the Windy City number crunchers, it was a game changer. “I think this will wind up being the most groundbreaking piece of technology developed for this campaign,” says Teddy Goff, the Obama campaign’s digital director. People whose friends sent them requests to vote early and register to vote, for example, were more likely to do so than similar potential voters who were not contacted. That confirmed a trend already noted in the political-science literature: online social networks have the power to change voting behavior. A study of 61 million people on Facebook during the 2010 midterms found that people who saw photos of their friends voting on Election Day were more likely to cast a ballot themselves. “It is much more effective to stimulate these real-world ties,” says James Fowler, a professor at the University of California at San Diego, who co-authored the study. Campaign pros have known this for years. A phone call or knock on the door from someone who lives in your neighborhood is far more effective than appeals from out-of-state volunteers or robo-calls. 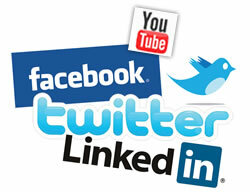 Before social networks like Facebook, however, connecting a supportive friend to a would-be voter was a challenge. E-mail, for instance, connects one person to the campaign. Facebook can connect the campaign, through one person, to 500 or more friends. And the technology is moving fast. In 2008, Twitter was a sideshow, and Facebook had about one-sixth its current reach in the U.S. By 2016, this sort of campaign-driven sharing over social networks is almost certain to be the norm. Tell your friends. Results from the Center for Disease Control (CDC) July–December 2011 National Health Interview Survey (NHIS) shows that the number of American homes with only cell phone service continues to grow. One-third of American homes (34.0%) had only cell phone service during the last half of 2011 — an increase of 2.4 percentage points from the first half of 2011. On top of that number, an additional 16 percent of American homes that still have land line (copper wire or digital VIOP) phone service answer incoming voice calls only on their cell phones, despite also having a land line phone in their home. These homes are identified as cell phone mostly. By the last half of 2011, 50 percent of all American cell phone only and mostly homes did not have a listed phone number that could be called through traditional voice phone bank get out the vote programs. By the end of 2012 that adoption rate will likely reach 56 percent of all American homes — and for homes occupied by people under age 35, that percentage jumps significantly higher. Nearly 6 in 10 adults aged 25–29 (59.6%) lived in households with only wireless telephones. This rate is greater than the rates for adults aged 18–24 (48.6%) or 30–34 (50.9%). The percentage of adults living in households with only wireless telephones decreased as age increased beyond 35 years: 36.8% for those aged 35–44; 23.8% for those aged 45–64; and 8.5% for those aged 65 and over. More than three in four adults living only with unrelated adult roommates (77.5%) were in households with only wireless telephones. This rate is nearly twice as high as the rate for adults living alone (41.3%) and three times as high as the rate for adults living only with spouses or other adult family members (25.1%). More than half of all adults renting their home (56.0%) had only wireless telephones. This rate is more than twice as large as the rate for adults owning their home (21.2%). Adults living in poverty (51.4%) were more likely than adults living near poverty (39.6%) and higher income adults (28.9%) to be living in households with only wireless telephones. 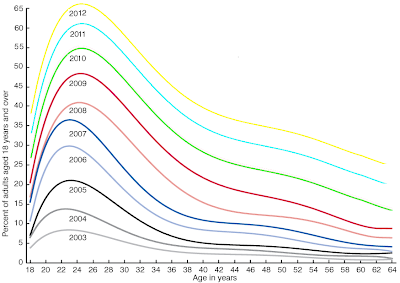 The graph below depicts the cell phone only adoption trend by age group. A majority of younger more progressive American voters can now be reached only by cell phone voice calls and text messaging. It is only the older (increasingly more conservative GOP) age groups that can still be reached by land line phone for voice and automated robo-call survey and GOTV phone bank contact. But even the older age groups are slowing going cell phone only. In Texas, 39.9% of all households statewide were cell phone only at the end of 2011, with cell phone mostly households (19.2%) bumping the number of households across all age groups that rely primarily or exclusively on mobile phones to 59.1%. Metro areas often have even higher cell-only adoption rates than the state as a whole. At the end of 2011, 53.3% of all Dallas County households were cell phone only with an additional 17.0% that were "cell phone mostly," according to a CDC survey published in October 2012. And remember, those percentages are higher for the younger and less affluent home owners and renters. Polls That Include Cell Phone Only Voters Give Obama A Big Lead.